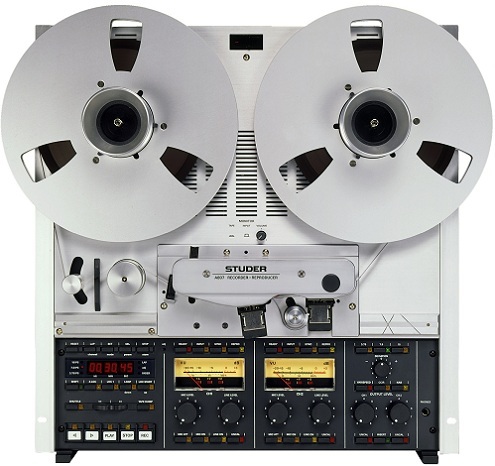 With the Studer A807's compact and rugged design, its system flexibility, and the high operating convenience afforded by its microprocessor, the STUDER A807 tape recorder satisfies all requirements of a universal studio machine, be it radio or television studios, recording studios, theater, film, auditoriums, or scientific institutes. ■ Highly stable die-cast aluminum alloy chassis for the tape transport, the headblock, and other assemblies. The new design extends the possible tape capacity and allows operation with 1000m standard tape. ■ Hall-commutated brushless DC capstan motor with capacitative tacho sensor for highly accurate tape speed and outstanding acceleration and deceleration rates. 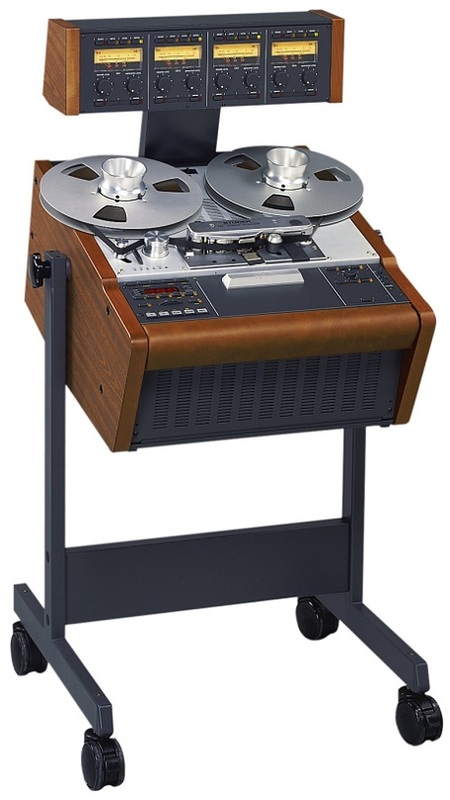 ■ Fast tape deck with high tape spooling speeds and gentle processing of the tapes by electronically controlled tape tension, 2 controlled AC spooling motors with photoelectric tacho sensors and noncontacting tape tension sensor. ■ Precision electronic tape counter with real-time indication. Photoelectric scanning of the guide roller rotation. ■ Easy editing: motor-assisted with variable spooling speed (SHUTTLE mode) or manually by turning the right-hand reel (one-handed editing). For cueing in spooling mode, the high end of the frequency response is lowered. ■ Monitor speaker below the tape deck cover or in the penthouse. ■ Manually operable shield above the reproduce head; can remain closed in spooling mode. ■ The basic version is available as a mono, 2-channel or stereo machine with or without external instrument panel. Special versions are available for timecode applications and for 1/2" tape (four channels). ■ Can be operated in horizontal, inclined, or vertical position. ■ Three of four available tape speeds can be selected: 3.75/7.5/15/30ips. Depending on the configuration either the slowest or the fastest speed is not available. 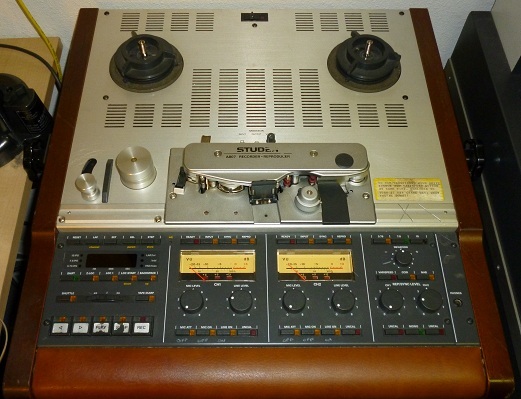 ■ The 1/2"-4-track tape recorder is available with the tape speed configuration: 7.5 / 15 / 30ips (19 / 38 / 76cm) only. ■ The inputs and outputs are balanced and floating, with input/output transformers. ■ Either with selector switch for two tape types with different calibration data, or with selector switch for NAB/CCIR equalization. ■ Zero locator and transfer locator for up to 3 addresses as standard features. ■ Dolby HX PRO headroom extension system as standard feature. 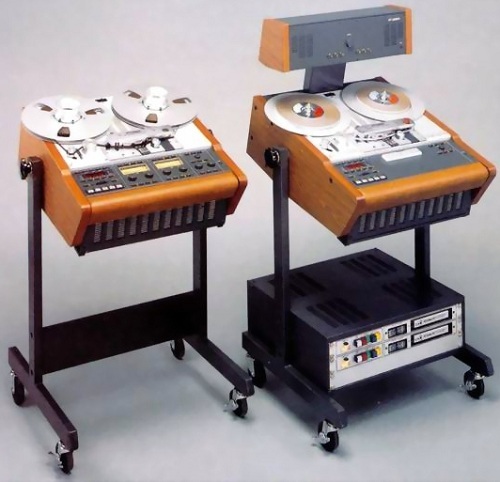 ■ Equipped with varispeed (variable tape speed). MIC ON (microphone input; this input does not exist on units equipped with external instrument panel); LINE ON (line input). The microphone inputs are always equipped with a 48V phantom power (changeover to 24 or 12V possible. INPUT, REPRO, and SYNC (reproduction via record head). VU-meter panel with input and output selection keys, level potentiometer for recording. ■ Adjustable for line voltages of 100 to 140V / 200 to 240VAC, ±10%, 50...60HZ. ■ Can be remote controlled from a terminal or personal computer via an RS232 interface. ■ Connection facilities for fader start circuit, parallel and serial remote control. ■ The last operating state is saved when the machine is switched off: tape counter, locator addresses, tape speed, setting of the input and output selectors. The STOP mode is automatically activated when the machine is powered on again. ■ Drop out by pressing PLAY during a recording. ■ Reduced spooling speed (LIBRARY WIND): A lower spooling speed can be selected for producing pancakes that are to be saved in the library. ■ TAPE DUMP (waste basket mode with disabled take-up motor). ■ LAP TIME (second time level for measuring individual tape segments without influencing the main tape counter). ■ Adjustment of the audio parameters and setting of "soft jumpers" via the keyboard. ■ LOC START positions the magnetic tape automatically at the address at which the last play or record command (for standstill) was entered. ■ Tape scissors and tape marker as well as a headblock cover plate with integrated scissors/splicing block. ■ Additional splicing block for units without VU-meter. ■ Extern connection for INSERT-lnput (slave points). Foundational text courtesy of Studer Literature. 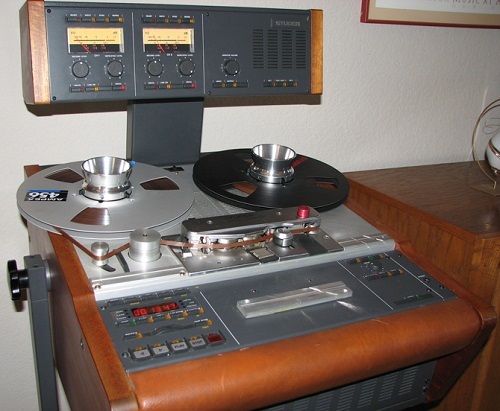 Do you have content, to add, about the Studer A807 Tape Machine or associated topics? Please feel free to Share it, here!